Ederson is a 23-year-old uncapped Brazilian stopper. MANCHESTER CITY HAVE made Benfica goalkeeper Ederson their second signing of the summer after completing the second-most expensive goalkeeper deal in history. Ederson will cost City £35 million, making him — in pound sterling — the most expensive goalkeeper in history, surpassing the £33m Juventus paid Parma for Gianluigi Buffon in 2001. However, City are keen to stress that it’s not a world record as the amount in Euros, which is how they paid Benfica (€40m), is lower than how much Juve paid for Buffon (€53m) in 2001. The 23-year-old — who is yet to make his debut for Brazil — has signed a five-year deal at the Etihad Stadium. Goal reported on Saturday morning that City were confident of concluding negotiations following Benfica’s Taca de Portugal final on Sunday , a game they won 2-1. Ederson flew into Manchester on Monday and was at City’s training ground on Tuesday to complete a medical and conduct interviews with the club’s in-house media channels, but official confirmation of his signing was held up by third-party ownership issues. He will battle with Claudio Bravo for a place in the Pep Guardiola’s starting XI next season, with Willy Caballero having been released and Joe Hart to be sold following the end of his loan spell at Torino. City’s summer spending now stands at around £80m, after the club announced the £43m capture of Bernardo Silva from Monaco on Friday. 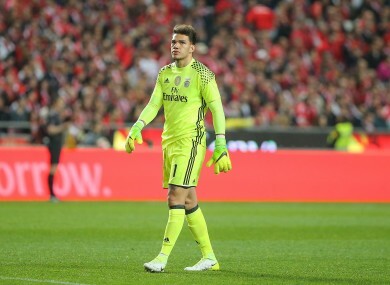 Email “Man City splash out €40m on Benfica goalkeeper Ederson ”. Feedback on “Man City splash out €40m on Benfica goalkeeper Ederson ”.